You don't often go far in life before you come across a person you wished your chosen higher power would b!tch slap around a bit, if only just to wake them up to their actions beyond anything else. But what if you were the b!tch-slapper, not the prayee? A nigh-unstoppable force, powered by the almighty to deliver vengeance. What would a job like that do to your soul? Jim Corrigan knows. After years of service, the man who entered the game with ideals of being a hero has literally seen and done it all. Now in The Spectre #62 he faces the reflections of his actions and his last wish - eternal peace. John Ostrander was a hell of a writer, and as such knew when to shush. Here, with artist Tom Mandrake doing more than words ever could, John leaves it at an exchange of good-byes from two men who truly were soul-mates in all the best and worst ways. 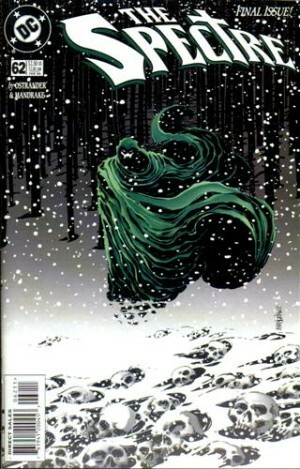 I only know the spectre from guest apearences on other characters books, but I have to say that scene was touching. Glad you liked it Aliera! Spectre is one of those guys I always think should have his own gig or book, and while I find it hard to picture anyone as Jim in the role, any Spectre is good Spectre!